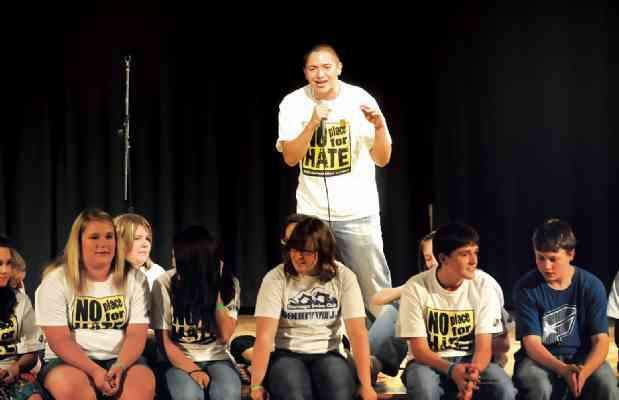 Adrian H. Molina of Denver raps after giving a talk at Miller Middle School during the “No Place For Hate” rally May 6. Miller Middle School recently was designated a "No Place For Hate" location by the Anti Defamation League, one of the first schools on the Western Slope to have achieved this designation. Organizers described some of the steps taken to achieve this designation, including events such as "mix it up day" at lunch, where the students switch lunch tables and meet new people. Students also must sign the Resolution of Respect, a pledge to stand up for fellow students in the face of discrimination. The school district's three elementary schools, two middle schools and the high school are involved in the "No Place for Hate" program. The Miller Middle School designation was celebrated at a school event May 6. In addition to the league, the school worked with Durango-based Del Alma to provide training and supplies to the school for free. Del Alma sponsored groups of students to join the Prejudice Elimination Action Team, which was trained for several days by a representative from the league. The goal is to have students be more attuned to different forms of discrimination, as well as help spread respect and understanding in their communities. "Schools are always changing. Every year there are new students and new staff. This is really an ongoing effort," said Tara Raju, the assistant director of education at the ADL branch in Denver. "We don't expect that problems will never arise, we don't expect an issue to never come up, we hope that when something does happen, it will be dealt with appropriately, and be learned from." Del Alma is a nonprofit organization founded in 1995 that has been working with Durango High School for more than a decade with more than 200 involved students. This is the first year that Miller Middle School has been involved. The designation must be re-earned every year, meaning Del Alma and the Anti Defamation League will have a continued influence at these schools. "The 'No Place For Hate' designation is a great goal for the schools to strive for," said Lee-Ann Vallejos, executive director for Del Alma. "The momentum will eventually turn the schools into more respectful environments, as well as keeping the event rolling."